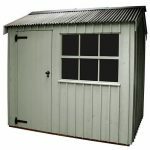 This isn’t the cheapest timber shed or workshop that we’ve reviewed, yet we still think it represents good value for money; that in itself is an indication of the high quality of this feature packed garden building. 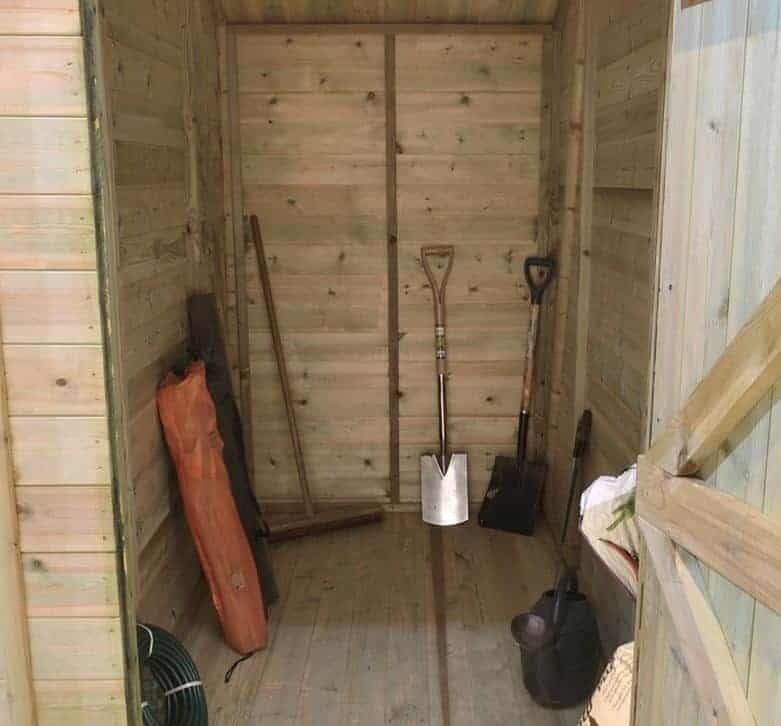 It’s very well sized which gives it added versatility, meaning you can use it as a base for storing your garden tools or as a workshop for a hobby or even for a small business. One feature we particularly liked is the secure storage area at the rear, accessible by a personnel door it has no windows so its contents are safely hidden away. The main body of the shed has two windows, both of which open to provide a natural source of ventilation when required. It also has a tall apex roof, which was good to see as it means that there is extra vertical space available for moving around in, and for storage purposes. If shelves and racking are installed, it’s surprising how much can fit inside. The roof provides another invaluable function, of course, in that it bounces rain away from its surface, keeping the interior dry. This is also accomplished by the cladding. Thicker than many tongue and groove timbers we see, they are also protected by an initial pressure treatment. For this reason the manufacturer has been able to give a very long 15 year warranty. This large apex roofed timber shed stood out for us for a number of reasons, foremost among them the combination design. Attached to the main body is a rear storage area that provides an extra secure environment for any items of value you may wish to store. Accessible by its own lockable single door, it’s a neat idea that we feel provides added value. Another thing that instantly struck us was the size of this building. It’s not only wide and deep, with overall measurements of 2.44m and 3.63m respectively, it’s also very tall. 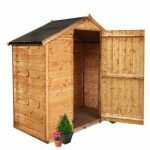 We were glad to see this, as some sheds with a large base area compromise it somewhat by offering a reduced height. Not on this occasion, as the ridge height of 2.31m and the eaves height of 1.73m shows. Made of tongue and groove cladding, it’s covered in a thick mineral felt which should be effective at keeping rain and snow out. 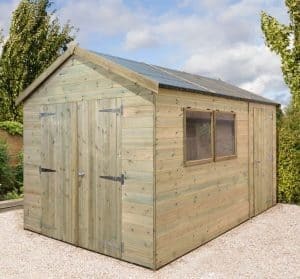 We feel that cladding is always important in a timber shed of this size, as inferior cladding can lead to them feeling unstable in windy conditions. 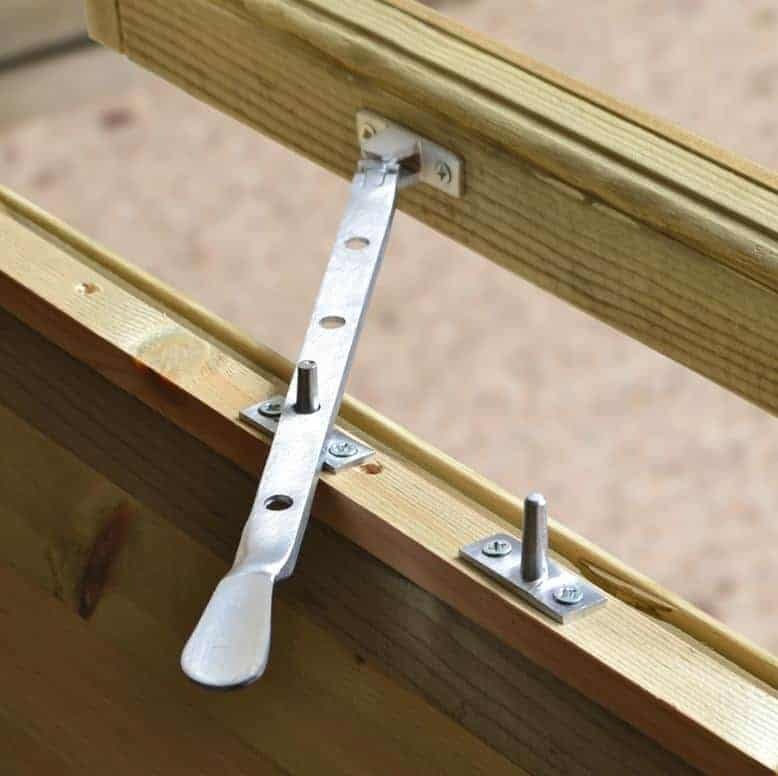 That’s why we were pleased to see that tough 12mm tongue and groove cladding had been used throughout, that is on the roof and floor as well as the walls. The frame too was slightly thicker than we sometimes find, at 34mm X 34mm, creating a reassuringly stable building. One feature we especially welcome is the integrated floor bearers. They’ve been pressure treated to give them long lasting protection, and by raising the floor above the ground they keep it away from potentially damaging ground moisture. The floor joists weren’t the only element that had been pressure treated, as we found that it had been used on all the timbers. It’s very effective at forcing wood pressure deep into the timber, giving it very long lasting protection against rot. With the tongue and groove cladding also effectively keeping water out, and therefore preventing rot, we had expected a long warranty period. 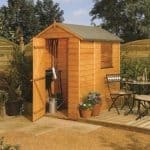 Even so, we were pleased to see that it extends for 15 years which is a long as any warranty we see on a timber shed. There are no treatment requirements given by the manufacturer, but we would still advise the owner to check it on an annual basis and apply more preserver if required. There are two doors on this shed, one on the front opening onto the main area and one at the back opening onto the rear section. They are both single hinged doors, and share the same dimensions of a width of 0.88m and a height of 1.80m. 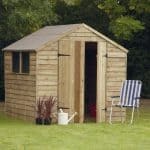 This makes them significantly more accommodating than many single doors we seem, which is yet another positive mark for this shed. There are also two large sized windows. We liked the fact that they can be interchanged, and therefore situated on either side of the shed. We were also pleased to find that they opened, which can be especially useful on a hot summer day, and that they featured toughened safety glass which is much more shatter proof than standard glazing. The toughness of the glass itself acts as a security feature, as does the fact that the rear section is completely free. We particularly welcomed this, as it means that prying eyes have no way of discerning what’s kept inside. The security features we liked most of all, however, were the tough key operated locks found on both doors, giving added peace of mind without the need to source and buy a locking system. 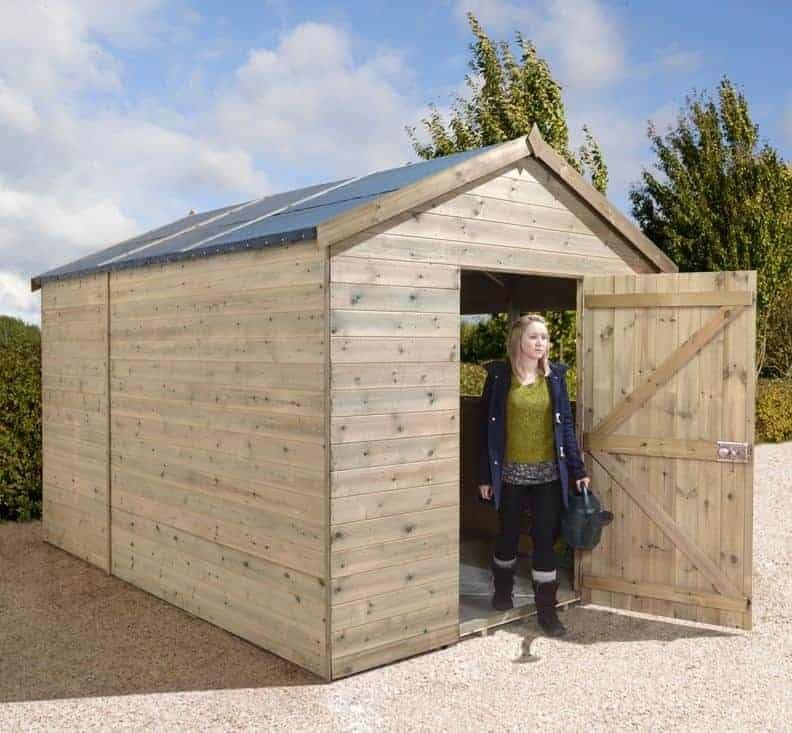 We were pleased with how straightforward the installation instructions were, but we appreciate that many people will be daunted at the thought of assembling such a large shed themselves. That’s why it’s so good to see a professional installation service offered as an optional extra. It costs £159, but can save a lot of time and, potentially, frustration. One other option available is a slatted roof, although we found that the standard roof supplied did a more than adequate job. With thick tongue and groove cladding used across all the shed, and not just for the walls, it was clear to see that this is a very high quality garden building. The 15 year warranty against rot not only gives the customer great peace of mind, it also shows how effective and long lasting the pressure treatment is. Unlike some sheds of a similar base size we see, the eaves height is also generous, and then of course there’s the secure storage area at the back. 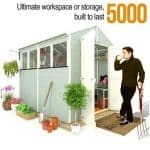 Simply because of its size and complexity, it can take six hours or more for two people to assemble this shed. If you don’t have that sort of time to spare, use the optional installation service. 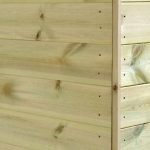 Even though this costs considerably more than a thousand pounds, we still feel it offers good value considering its size, quality, and durability. 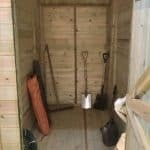 Final Thoughts: We were impressed by this shed at first sight, with its large dimensions and it’s traditional almost rustic charm. In fact, we can see it making an ideal workshop for a hobby or a small business, particularly thanks to its secure storage area. It means that you won’t have to worry about any items of value you have, as they are kept out of sight at all times and also protected by a secure key operated lock. Thanks to the two windows, there’s lots of natural light inside the main section, and they can also let in fresh air as well whenever required. One thing we would advise, however, is painting or staining the timber, as this will prevent the wood from fading over time.